The Sun has moved over the Celestial Equator into the Northern Hemisphere, a moment otherwise known as the Vernal Equinox. The flaming center of our solar system—the Sun—has great impact. The movement of the Sun between the hemispheres of our Earth reminds me just how much. Right now, the southern lands are starting to feel the waning of their growing season. A season’s worth of the Sun’s impact leaves them with their harvest—a harvest that those of us living in the north can only imagine at this point. Where I live, spring is but a dream. In Minnesota the ground is still thawing. But we notice the Sun. Longer days mean the Earth here is waking up. Longer days signal a desire to emerge from winter’s dormancy into growth and action. Sometimes this transition is bold and sometime less than graceful as we stumble from our beds into the rising Sun. I think that may be the best way to describe Aries, the sign of the spring season—the sign of waking up. Something very important is happening. The Sun’s movement reminds us in physical and symbolic ways that profound change is on its way. We can’t stop the Sun, or the Earth spinning, or the waking of dormant life even if it scares us, this change. Even if we can’t manage it gracefully. I am noticing this aspect of change in my life and am breathing into these challenges. When astrologers talk about uncontrollable change, they often are talking about Uranus. Here is how astrologer Howard Sasportas describes Uranus in his excellent book on the outer planets, The Gods of Change: “On a personal level, a Uranus transit is associated with change and disruption, and a phase in our lives when something new—something ‘eccentric’—needs to break through into conscious awareness.” I’d say this applies to the interpersonal and global levels of life too. We’ve been in an enormous waking and changing period since Uranus entered Aries in 2010. Recently, a prolonged (December through March) opposition between Jupiter in Libra and Uranus has pushed us into even more disruption. The questions I am asking are: What needs to break into my conscious awareness? How do I need to awaken? What is at stake if I don’t? Spring’s emergence can be messy, emotionally. The past lunar cycle in Pisces may have opened up some vulnerable places for you. That is part of the Pisces process, which prepares us to begin a new cycle of growth in the season of Aries. Aries can be impulsive and unthinking when it is not in touch with our tender feelings. The best part of Aries comes forward when vulnerability is on the surface. Then, Aries can make stunning leaps into authenticity and connection, acting courageously even when it feels afraid. The worst part of Aries comes from disconnection to their impact on others as the waking sleeper stumbles over everyone. The season of each sign is an opportunity to notice these behaviors in ourselves, even if we aren’t that sign. The Aries Sun is shining a light on how we may have been sleeping through life. Waking up can bring uncomfortable insights about ourselves. Self-inquiry is helpful to wake up in the best possible ways. 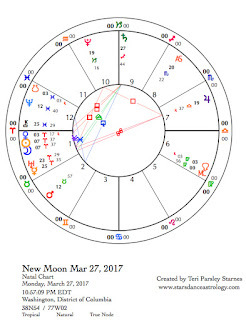 At this Aries New Moon, which begins on March 27, seeds of awakening are planted and quickly germinate. The Sun adds light to the process. Perhaps the Sun’s light is just what we need to see ourselves. It can be hard to stand naked under the light. This lunar cycle is an opportunity and a challenge to live with that discomfort. Personal scrutiny becomes collective scrutiny. Audre Lorde’s insight about the quality of light by which we scrutinize our lives invites us to connect personal awakening with collective awakening. What do we need to know about ourselves? Which light will we use to scrutinize our choices and impact? Relationships are waking up too. Venus turned retrograde in Aries on March 4. This journey of the planet of connection in the sign of individuality (Aries), may have played havoc with your relationships. The relationship between Self and Other invites us to expand beyond previous states of understanding. This can be messy too. Venus is still retrograde and will be entering Pisces again on April 2. Venus turns direct on April 15 and goes back through the degrees of retrograde (from Pisces into Aries) until May 18. It could take us that long to unravel the relationship complications of this Venus transit. Venus remains in Aries until June 6. If Aries is about emerging with vulnerability into change, then we have work to do in the realm of relationship this spring to allow for vulnerable spasms of connection and disconnection. How has communication been going for you? Mercury in Aries has been triggering impulses of awakening as this planet contacted Uranus, Jupiter and Pluto during the last week of the Pisces lunar cycle. On March 31, Mercury enters Taurus but then moves retrograde on April 9, returning to Aries on April 20. Two planets, Venus and Mercury, are retrograding through Aries this spring. This tells us to rethink the ways we relate and communicate, especially when we are unaware of our connections to each other as Aries can sometimes be. Mercury will conjoin Uranus two more times—April 28 and May 10.There is more to be uncovered and illuminated about our methods of connection. Under this influence, secrets are blurted. Words are misspoken. But there is also the potential for brilliant, though unnerving, breakthroughs. Even our mistakes can be a wake up call. 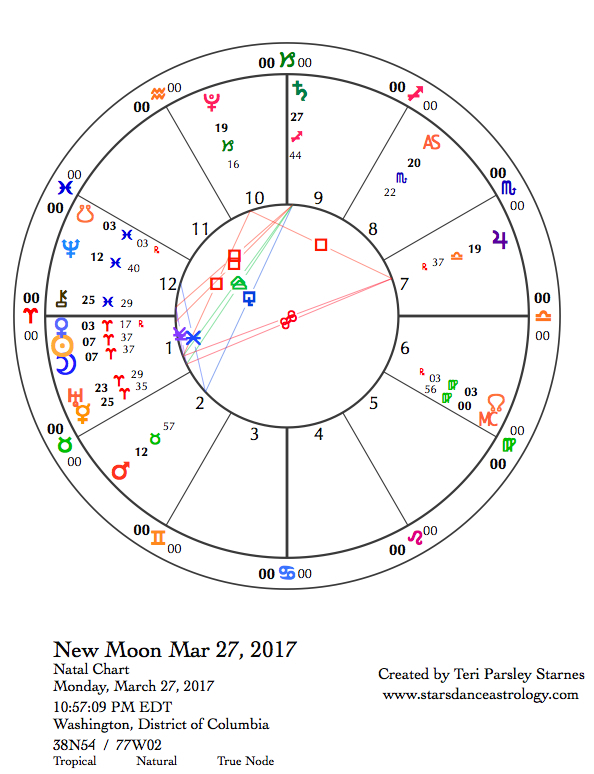 The chart for the New Moon in Aries shows an exact square between Jupiter in Libra and Pluto in Capricorn. These planets conspire to expose things that have been hidden. Power issues, both personal and political, come to the surface. Jupiter wants justice, seeks a balance between extremes. Pluto represents the choice between maintaining power at all costs or overthrowing toxic power systems. Under the influence of these planets, there is no middle ground even though we may wish for one. This adds a special and intense flavor to the desire to awaken. Perhaps we are desperate for change. The Sun in Aries will bring light to collective and personal awakening this lunar cycle. Especially potent days to expect disruption, scrutiny, and breakthrough are April 7 when the Sun opposes Jupiter, April 8 with the Sun squares Pluto, and April 14 when the Sun conjoins Uranus. The time for going back to sleep is over. At times, this awakening could feel exciting. At other times, like we’ve been struck by lightening. This type of sudden awakening relates to the effects of Uranus in Aries. I’ve found that the best way to negotiate with Uranus is to agree to change at least a little. The change can be small. Something like a new haircut or painting your room. Even the tiniest movement under this influence can create a cascade of awakening. And it seems to me that being awake is the best thing we could do to shift into conscious relationship to life. It is the great challenge of the moment. Contact Teri Parsley Starnes at teri@starsdanceastrology.com and visit her website at www.starsdanceastrology.com to learn about booking a reading of your chart. Like her Starsdance Astrology page on Facebook to receive these forecasts daily and learn of other offers and events.